Italian family dinners are never short of a spectacle. It is no surprise Canadian playwright Steve Galluccio chose to have all the action in the Centaur Theatre for The St. Léonard Chronicles, which takes place within the confinements of a young Italian couple’s kitchen in their staple St. Léonard duplex. Family, pride, heritage and identity are some of the main themes explored through the characters and dialogue. 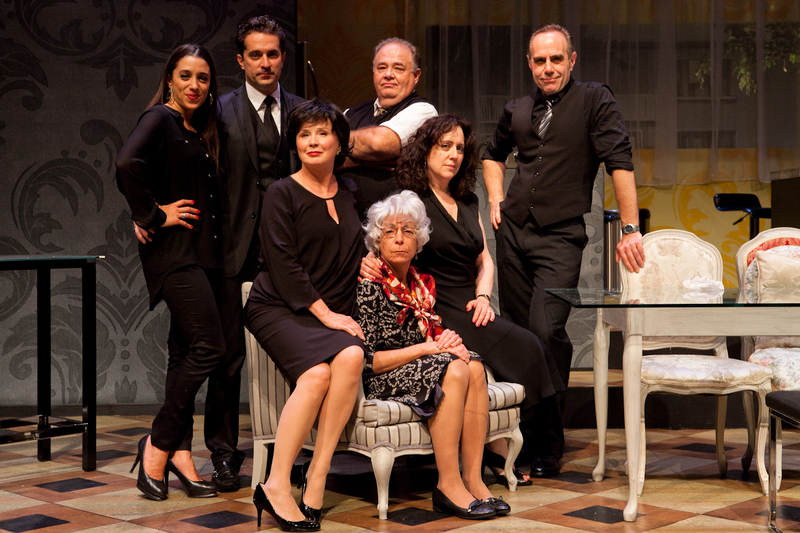 Directed by Roy Surette, the play explores the Italian community’s need to stick to their roots. Young couple, Terry (Christina Broccolini) and Robert (Guido Cocomello) struggle to break the news to their families that they will be selling their St. Léonard duplex to move into a cottage in Beaconsfield. Sick of their mundane life in St. Léonard, including the vegetable gardens and the noisy tenant in their duplex, the couple doesn’t want to follow in their parents’ footsteps. The story turns to the reactions of parents Gina (Dorothee Berryman), Carmine (Michel Perron), Dante (Vittorio Rossi) and Elisa (Ellen David). They are outraged. “What are you going to feed yourself with in Beaconsfield, Tim Horton’s Lasagna?” Dante asked his son. In true Italian fashion, one controversial topic brought up at the dinner table spirals into a full-fledged war, and shots are fired from all corners. Love affairs and lies are outed and thrown into the mix. It comes as a bit of a surprise, and while it makes sense, it also feels at times that the plot is moving a little too quickly. Nonna Dora (Jocelyne Zucco) is the anchor of the ensemble. Coined by her daughter Elisa as having “a touch of dementia,” she delivers the cringe worthy stories and wisdom that Italian grandmothers always have up their sleeves, providing for many humorous moments. However, her stories of forbidden love back in her hometown of Italy, and her unhappiness in her relationship with her late husband paint a picture of an issue often swept under the rug in Italian families. The set decor is minimal, with the window to “outside” facing the audience providing a clear view of a St. Léonard duplex. The Italian-English dialogue is not ignored, with an array of Italian swear words being thrown here and there from one cast member to the other, and the use of many common grammatical errors made by Italian-Canadians. The play relies heavily on many stereotypes, and while it is not overdone, it does dance on the fine line between realistic characters and caricature. However, dialogue about fears of immigrants and racism, the wasting of food, and the respect one must have for a man’s homemade wine blends well within the story. The play begins with a family dinner, yet it ends with a funeral, all the while taking place in the same kitchen. Tears are shed as the story takes a turn for a more serious second half. The actors show great depth, switching from comedic lines to more heavy material quickly. It would have been nice to see them fleshed out a little more, especially with such a great cast. Still, Galluccio does a good job at portraying the colorful, loud, resilient and proud (sometimes too proud) nature of the Italian-Montreal community. The spectacle comes together providing laughter, tears, and self-reflection. One is left thinking about the short time they’ve been given on this planet, and how to surround oneself with love, happiness and family. The St. Léonard Chronicles will be playing at the Centaur Theatre until Dec. 1. For tickets and more information visit: centaurtheatre.com.